Today we’re going to be looking at the best office desks under $100, as I’m sure we all have a budget that needs to be met. Whether you’re looking to start a new set up or upgrade your current one, one of these home office desks could be the right choice for you without breaking the bank. I remember when I first decided that I want to do affiliate marketing for a living and not being able to afford a desk and having to work on the dining table at my mom’s house. Boy was that a really low point in my life but one that taught me a lot of lessons. That so called desk I was using required me to use my laptop and a really long extension chord. Although it wasn’t really a perfect desk, or even a desk for that matter, it had the space that not even my current desk can provide. Did that dining table really help me figure out what desk was really best? I think so and I want to share those ideas with you. Being that this is a post designed more for your wallet, we of course had to find desks that were very affordable and under $100 or it wouldn’t meet our standard. Quality is always a must, so that is what we considered next when picking our best desks. As a stay at home dad that works on a desk every single day, functionality is a must and that is what comes next on deciding what desk is really going to make this list. Then comes all the little things like style that still play a role in our decision but is not that big of a deal as we are more focused on the points mentioned above. So before you make that next investment, lets look at some of the desks that I think are really good for an even better price. For the first desk on our list, we have the common and best seller on Amazon, the Altra Dakota home office desk. This home office desk comes with a few variations like the side shelves and also if you would like to drop a little more cash you can get a hutch for the top to give you a little extra storage space if needed. They have a third style option that feels a little bit more executive offering a two-tone color scheme, with no additional storage shelves or hutch though, so consider that when purchasing. The only variation this desk can come in all three colors black, brown, and white. Added bonus holes with grommets are pre-installed to help with your cable management, giving you a cleaner home office desk surface look. Something so simple but definitely a huge plus when it comes to getting your next desk. The Ameriwood Home Dakota office desk is available on Amazon for $90.87 and includes free shipping. For under $100, this is my most favorite desk just for it’s space alone. The Ikea Mickie modern computer desk is a very stylish and minimalistic desk that’s perfect for single monitor setups with a PC on the side or a dual monitor setup with the PC on the floor. It only costs $94.99 depending on where you live and they come in a variety of colors. There’s even some with different variations and you can pick one up with a drawer on either side or get one without. The standard version comes with two drawers on the top and a drawer on the bottom, which you can use to store your PC or other items. It also comes with a rack underneath to help with the cable management, which is great if you’re somewhat of a neat freak like I am. There is a pre-drilled hole on the top that can be used to wrap the wires. Honestly, for the price and the size of this desk, it offers a lot of nice features, this is definitely one of my favorite home office desks. Check it out on Amazon to see the different colors as I’m sure you might think differently if you saw this in a color you actually like. This desk has a black or frosted white glass top and normally I want to recommend a glass top because it makes it kind of hard to hide the cables but for this price point, it is a solid choice for a home office desk. The overall construction of the Walker Edison home office desk is pretty good and includes a pullout keyboard tray sphere. If you are the kind of person that likes to keep your home office desk surface clean you are in luck. There is a white version of this home office desk which doesn’t look too bad if it helps compliment your color scheme, whether it is black and white, blue and white or really any color in white. The Walker Edison Soreno 3-piece corner desk costs around $91.99 on Amazon and comes with free shipping as well. Our third choice is probably one of the most common home office desks for setups right now. It’s cheap price point and a wide range of sizes might make the Ikea new computer desk table the best choice on this list. It gives you the opportunity to keep inside your budget while still getting what you need. It comes with a large selection of colors as well as styles to help pinpoint the area you’re trying to fill. 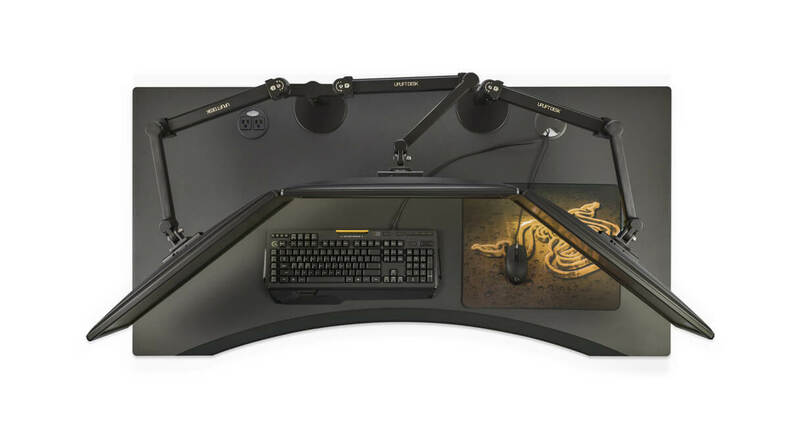 They even include a corner desk and it’s great for a single all the way up to triple monitor setup so you really can’t go wrong with any size. I think it looks pretty nice and it costs just $61.65 on Amazon. If that isn’t cheap enough for you then you might not be ready for a real desk just yet. Looks like we have another ultra desk on this list. Coincidence maybe or maybe not. This is an Altra Parsons desk, this great straight home office desk suits a single monitor or laptop setup best so if you need space, this might not be for you. However, the desk comes with a center pullout drawer which is perfect for storing additional items that you might use on your computer daily without taking up service area since it is a little bit on the small side. It comes in a variety of colors including a wooden version that looks really nice with the right surroundings. An additional version can come with an adjustable back plate that you can flip up to rest items like books and tablets against. The Ameriwood Home Parsons desk is listed on Amazon also for about $73.77 and comes with around a dozen color choices making it probably the most colorful desk option on our list. Last and certainly not least, we have another budget desk on this list that is a straight table design. This is the Tribesigns computer desk. It has a fairly large surface area and offers a two-tone color scheme. The crossbar supports can help hide cables if you hang them from the roof of the desk and also looks pretty well in just about any room if you go with the right color. The tabletop is scratch and waterproof, helping the desk last long and it looks like they also say the legs are rust proof which is nice. The Tribesigns modern simple style computer desk looks like a very solid build and they offer a black and white version as well as a black and walnut design. This home office desk is 47.2 inches long, 23.6 inches deep and 29.2 inches tall which makes it a good deal for a single monitor setup or even a double monitor setup. If you choose to leave your PC on the ground you can pick it up on Amazon right now for $99.99 and that includes free shipping. They also have a 55-inch version that will probably just throw you over the hundred dollar limit but it is there if you feel the need for more space. I know we all have different taste and some things might not look the best for some of you but these are what we found. There are definitely more to choose from, but a lot didn’t meet our standard. Now if you have some of your favorite desks, please do share it in the comments section below as I’m sure we would all like to compare them. I will be adding more as more are created but for now, I hope this article would be helpful to you if you are in the market for a new home office desk. Previous Post: « UpLift 900 Standup Desk Review – Pricey But Is It Worth It?